Last month I was in Austin, Texas, celebrating my husband as his financial planning practice was recognized as one of the best in the country. While there we had the pleasure of hearing former US Navy Seal Clint Bruce speak on how to be an elite achiever in our everyday lives. 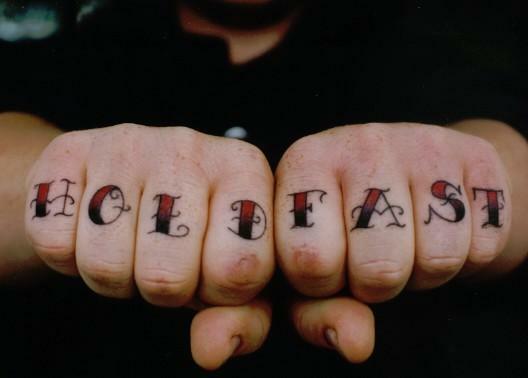 Bruce said that he had written the phrases “HOLD FAST” and “STAY TRUE” on his knuckles so that he would remember what to do in the middle of combat. HOLD FAST was so that he could brace himself against the onslaught of his enemies, knowing that they were coming for him hot and fast so he needed to be ready to hold his ground. Hold Fast. STAY TRUE helped him remember the principles that he had been taught while training to be a Seal, knowing that if he deviated from the truth, it could result in death. It also served as a reminder to protect and assist his fellow Seals while in the heat of the battle. Stay True. These are life-changing principles for us to live by as well. In this verse Paul is teaching us the same thing that this Navy Seal was taught in his training. There is an enemy that seeks to kill us. It is imperative that we be on our guard and hold fast against his attacks. Paul also instructs us to stay true to our faith, even when it’s hard, even when we’re beyond ready to give up, even when we feel lost. It’s in those moments that the elite achiever takes hold of the Light and stays on course. So I ask you the same question that Bruce asked me: do you have what it takes to be an elite achiever? I believe you do. Be courageous. Be strong. HOLD FAST and STAY TRUE. I'm a southern girl who loves the Lord, loves family, and loves life.